The Clemco Clem-Cool Air Conditioner (CCAC) Allows The Blast Operator To Control The Temperature And Volume Of Air To A Clemco High-Pressure Type CE Continuous Flow Supplied-Air Respirator Within A Preset Range And To Cool The Air By As Much As 50 Degrees F.
Pressure Requirements Vary With Hose Length. 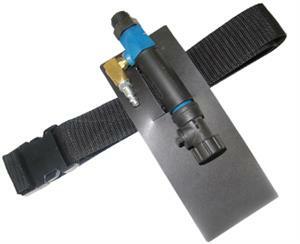 (Hose Offered In 25 Foot Increments) Minimum Pressure To Produce Minimum Airflow To Respirator. The Clem-Cool Air Conditioner Is Placed Between The Respirator Air Supply Line And The Helmet Breathing Tube. A Knurled Knob On The Valve Lets The Operator Adjust The Cooling Rate Of The Air Entering The Respirator. The Clem-Cool Air Conditioner Cannot Be Closed Completely, So The Operator Always Has At Least The Minimum Air Volume Required For Breathing And For Maintaining Positive Pressure Inside The Helmet. The CCAC Comes With A Belt That Adjusts To Fit Up To A 54-Inch Waist. The Durable Buckle Can Be Fastened And Unfastened With Gloved Hands. A Belt-Mounted Heat Shield Protects The Operator From Warm Exhaust Air (A Byproduct Of The Production Of Cool Air). The Clem-Cool Air Conditioner Is Approved By NIOSH For Use Only With Clemco Apollo HP High-Pressure Type CE Supplied-Air Respirators (Not For Use With Low-Pressure Respirators). The Clem-Cool Air Conditioner Is One Component Of A NIOSH-Approved System; Use Of Counterfeit Parts Voids The NIOSH Approval. To Maintain NIOSH Approval, Use Only Genuine Clemco Apollo Replacement Parts.